We are giving away a FREE fresh Bowman & Landes Thanksgiving turkey! Did you know that Bowman & Landes raise their free-range turkeys in the open air and sunshine, without antibiotics? Now is your chance to win a Thanksgiving Turkey direct from their farm in New Carlisle! Scroll down to enter now! Thanksgiving - a holiday where people will travel hundreds of miles to gather around the dinner table and enjoy time with their families. And the centerpiece of that table? By some estimates - over 45 million turkeys. 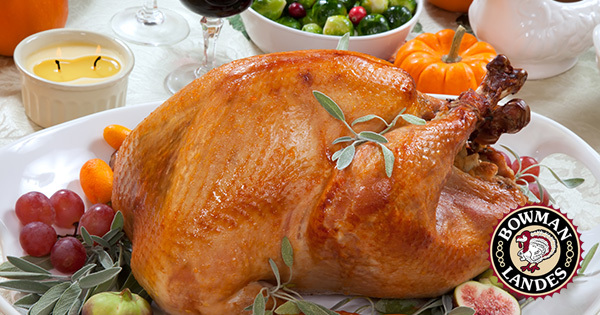 And what could be better for your centerpiece than a premium free-range turkey from local farm, Bowman & Landes? The Bowman & Landes turkey farm is located just north of Dayton in New Carlisle, and their turkeys are vegetarian fed, raised in the open air and sunshine, and without the use of antibiotics. In fact, as one of Ohio's largest free-range turkey farms, they supply over 300 meat markets and independent grocers in the Dayton, Cincinnati, Columbus and Indianapolis regions. Here's another little know fact: they also have a retail store on their farm. That's right, you can pre-order your Thanksgiving turkey directly from Bowman & Landes and pick up from their farm store right before the holiday. Even better - Dayton Local has teamed up with Bowman & Landes to GIVE-AWAY a turkey to one lucky family in the Miami Valley. Scroll down for your chance to WIN your Thanksgiving turkey! The winner will be randomly selected next Saturday, November 17. No purchase necessary to enter. If you have already ordered a B&L turkey at bowmanlandes.com or by phone, you are still eligible to enter the give-away - if you win and have pre-ordered, you won't be charged at pick up. The winner for 2018 is Virginia M! Bowman Landes will contact the winner directly with instructions on how to claim. Thanks everyone for participating, and Happy Thanksgiving! - Enter now for a chance to win! Dayton Local does not use the information you provide for anything other than this contest. Period. You will get an email confirmation that your entry has been submitted. If you win, you will get a second notification email. Good luck everyone! Located in New Carlisle, Bowman Landes has maintained a reputation for value and flavor that sets us apart, and brings people back for more! Our free range turkeys are raised in the open air and sunshine.